Have had to look at this plumber on my desktop all of today. 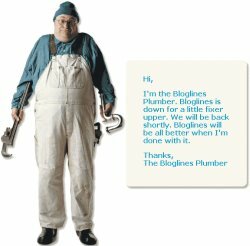 Seems bloglines is going through a major technical downtime. It’s been about 6 hours now since I last saw them online. But it’s been a very busy day at office, so I really didn’t miss my blog list much since I haven’t got those few free moments to catch up on what’s happening elsewhere. Just hit me – this is my first post for the new year. I am yet to upload the photos from the New Year party we celebrated at the US Club. Whenever I hit comments button here it leads to “404 error…not found” page..
Inorder to post comments here I’ve to go to the permanent link of your post and then proceed..!